In his National Affairs article, JMC board member and faculty partner James Ceaser examines how the concept of political founding evolves throughout ancient, modern, and American political thought. America reveres its founders. They are portrayed on monuments large and small, celebrated on national holidays and invoked in everyday conversation, and commemorated by the names of countless cities, schools, and streets — none more iconic than Madison Avenue. This focus on founding, however, is more the exception than the rule in the world today. There was, of course, a founder of the communist Soviet Union (Lenin), fascist Italy (Mussolini), and national-socialist Germany (Hitler), but these regimes are no more. Atatürk, once hailed as the great founder of modern Turkey, has largely been erased by Erdogan, and Mao Tse-tung just barely hangs on in China. Among democracies, there is still a place for Gandhi in India, Mandela in South Africa, and perhaps Havel in the Czech Republic and de Gaulle in France. But other European nations, like Britain or the Netherlands, have grown into their current condition without a founder. 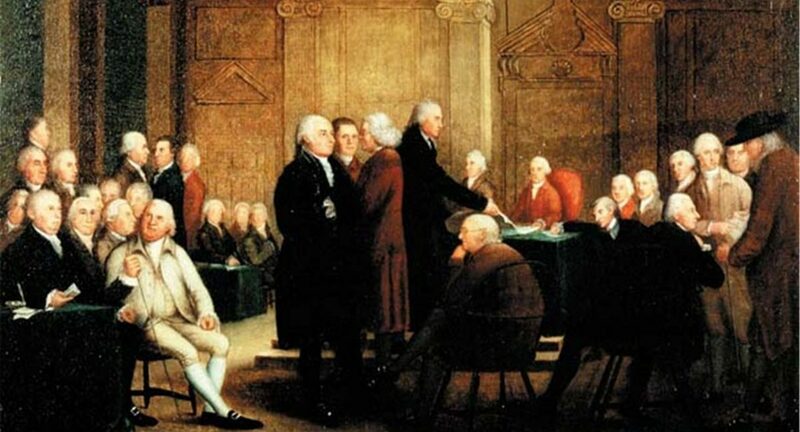 America, by contrast, has made the founding a central theme of its political science. And yet Americans are remarkably imprecise when it comes to assigning the label of founder. To whom should it apply? For most, a founder probably refers to an “important political figure back then” who helped the nation get started. At an Independence Day celebration on July 4, between eating grilled hot dogs and viewing fireworks, Thomas Jefferson may well be mentioned, but no one would take exception if George Washington, James Madison or Alexander Hamilton were as well. These men and others are variously ascribed the title of founder for having contributed in some way to launching a new political order. Let us try, however, for a little more precision. “The founding” may refer to three distinct moments in the establishment of the nation: the Revolution, the writing and ratification of the Constitution, and the launching of the government and passage of the Bill of Rights. The founding period thus runs from the battle of Lexington in 1775 through the end of Washington’s first term in 1793. Those meriting the appellation of founder include our revolutionary leaders (Franklin, Adams, Jefferson, and Washington), the principal figures who prepared and defended the Constitution (Madison, Washington, and Hamilton), and the political actors who helped shape the new federal government in its first few years (also Washington, Hamilton, and Madison). If someone demanded to know which of these three moments should be designated as the founding, most historians would probably give the prize to the constitutional period of 1787-1788. At the center of this event was James Madison, the person subsequently labeled “the father of the Constitution.” Madison was essential in forming the new government and in defining the terms of debate at the Philadelphia Convention. Along with Hamilton, Madison was also a main author of the Federalist Papers, which explained and defended the Constitution during the ratification contest. Feeling he was duty-bound by an implicit agreement reached in many states during the ratification debate, he was also the chief force behind the passage of the Bill of Rights through Congress in 1789. This is all well-covered ground; less well known, and more fundamental, is Madison’s role in introducing the concept of founding, or lawgiving, itself. Before there could be a founding, there had to be an idea of founding. It had to become part of our way of thinking, and it was Madison who supplied this intellectual breakthrough. He, more than anyone, served as the founder of the American idea of founding. Professor Ceaser gives a lecture on the subject of his National Affairs article at Univeristy of Colorado, Boulder’s Center for Western Civilization, Thought & Policy. He is introduced by JMC fellow (and former postdoctoral fellow at Ceaser’s UVA program) Shilo Brooks, who is now an instructor at UC Boulder’s Herbst Program of Humanities in Engineering and is on the CWCTP executive committee. James W. Ceaser serves on the board of the Jack Miller Center and is Professor of Politics at the University of Virginia, where he has taught since 1976 and directs the Program on Constitutionalism and Democracy, a JMC partner program. He has written several books on American politics and political thought, including Presidential Selection, Liberal Democracy and Political Science, Reconstructing America, and Nature and History in American Political Development. Professor Ceaser has held visiting professorships at the University of Florence, the University of Basel, Oxford University, the University of Bordeaux, and the University of Rennes. Professor Ceaser is a frequent contributor to the popular press, and he often comments on American Politics for the Voice of America. Next: Was the American Revolution a Just War?